Free. On occasion, riders may be asked to show proof of age. This card allows seniors and individuals with disabilities to take advantage of discounted fares. These cards can be obtained at the GET office at 101 11th Avenue. Seniors need to show a photo ID and proof of birth date or medicare card when boarding bus. Those with disabilities need to show a photo ID & physician’s certificate or Medicare Card as proof of disability. Free photo IDs are available at the GET office. Purchase at the Greeley-Evans Transit office, Greeley City Hall, Evans City Hall, all King Soopers and Safeway stores, and the Greeley Senior Center. 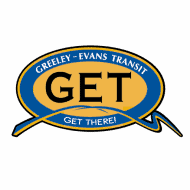 Purchase at the Greeley-Evans Transit office or at Greeley City Hall,.